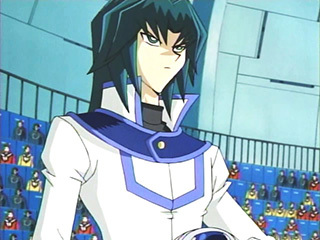 Chazz Princeton – is an arrogant duelist who serves as one of Jaden’s rivals throughout the series. Jaden has dueled him far more times than any of his other opponents in the series. Through his evolution, he goes from being a duelist who only respected powerful cards to a duelist who believes that there can be effectiveness in any card. Chazz is considered Jaden’s main rival in the same effect that Seto Kaiba is the rival of Yugi Muto. However, their rivalry has since lessened as Chazz’s character evolved. In the beginning of the anime, Chazz is a selfish duelist who believed himself to be the most elite duelist in the school. He is the youngest of three brothers, with his siblings Slade and Jagger, heads of the political and financial worlds, respectively. Due to this fact, Chazz is pressured into becoming the head of the dueling world to ensure the superiority of the Princeton family name (“Manjoume Group” in the Japanese version) worldwide. Despite having access to rare cards provided by Vellian Crowler, Chazz is defeated by Jaden early on in the first year. He is then overwhelmed by Bastion Misawa, and eventually became so dispirited and confused from his losses that he left Duel Academy to enter North Academy. There, he defeated the top duelists and becomes the “king” of the school. It is at this time that he gains the catch phrase “Chazz it up,” while in the original version of the series it is “iichi, ju-, hyaku, sen, Manjo-me-sanda-” (meaning one, ten, hundred, thousand, Manjoume Thunder), which serves as a pun given that the “Man” portion of his surname is the symbol for the number ten-thousand, and is preceded by the numbers one (ichi), ten (ju-), hundred (hyaku), and thousand (sen). In the latter case, he also acquires the moniker “Manjoume Thunder” (Manjo-me Sanda-). Due to his insistence that he be addressed respectfully, he often finds himself correcting others who merely call him “Manjoume” by saying “Manjo-me-san da!” (“It’s Manjoume-san!”; “-san” being a Japanese honorific). The students of North School, however, mistook the title as “Manjoume Thunder” (“sanda-” being a Japanese pronunciation of the word “thunder”), and the name stuck upon his return to Duel Academia. In the English version, he often refers to himself in the third person as “The Chazz”, and at times uses the phrases “It’s go time” and “You go bye bye”. Acting as North Academy’s representative duelist, he was defeated again by Jaden, but realized the errors of his ways and was finally able to take charge of his own life (during the duel, Chazz tried to win his own by using the deck given to him from North Academy for the duel as opposed to the deck that his brothers wanted him to use). He was welcomed back to Duel Academy, but forced to restart his studies out of the Slifer Red dorm. From the ordeal, Chazz obtains a spirit partner in the form of Ojama Yellow, who Chazz finds annoying. Chazz has suffered many defeats in his time at Duel Academy (the humiliation of being beaten by both a Ra Yellow and Slifer Red the reason he left Duel Academy). He becomes a marked threat after becoming the North Academy representative but after that becomes more and more a comic relief character. Despite all this it is important to remember just how dangerous an opponent Chazz can be. At the start of his third year he had beaten every one of North Academy’s elite duelists as well as a fair share of the Society of Light. Quite possible his most impressive win was when he dueled one of his older brothers, and despite that Chazz had a severe handicap of only able to use monsters with 500 attack points or less and going against his brothers deck of very strong cards, Chazz still won. While he always seems to come out just behind Jaden, Chazz is possibly the second most talented permanent student in all of Duel Academy. Due to his dueling skills, Chazz is chosen as one of the seven keykeepers charged with keeping the Shadow Riders from reviving the Sacred Beast Cards, and later faces Slade in a duel to determine ownership of Duel Academy. In the chain of events leading up to the duel, Chazz finds Ojama Black and Ojama Green, both of which join Ojama Yellow as his spirit partners. During this time, his feelings for Alexis Rhodes also become common knowledge; he constantly chases after her, love-struck, despite her protests. In the original version of the series, Manjoume even goes as far as to address her brother Fubuki as “onii-san,” treating him as though he were his brother-in-law. During the second year, Chazz duels Sartorius for the opportunity to rise to the Pro-Leagues, but loses. As a result, he joins the Society of Light, acting as Sartorius’ means of converting the top students of Obelisk Blue and Ra Yellow. In the Japanese version, his nickname becomes White Thunder (Howaito Sanda-) from that point on until his defeat in episode 88. However, his love for Alexis Rhodes till continues, to cause him much embarrassment. He, whenever possible, humorously tries to convince Syrus, Bastion, Tyranno Hassleberry, and Alexis to join the Society of Light. After seeing Chazz’s ruthlessness with the new White Knight (Shirokishi-dan) deck given to him by Sartorius, Jaden duels him with the cards that he himself once used: The Ojama Trio. After Chazz defeats Bastion Misawa and converts him to the Society of Light Chazz gets rid of the Ojama brothers. However after he did he starts to become haunted by his memories of the past. 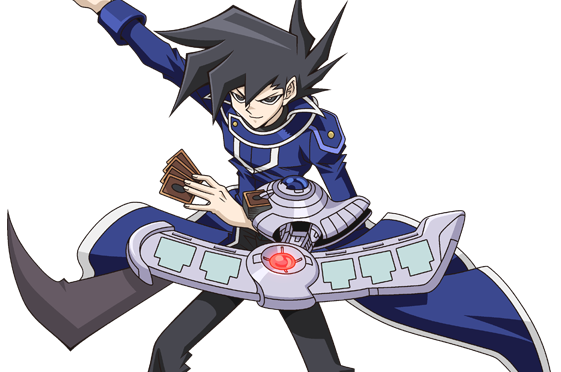 During the match, Jaden shows Chazz his old black uniform, and Chazz eventually regains his senses, tearing off his white coat to don his signature black one once more. Chazz, back to his old self, retrieves the Ojama Trio to destroy White Knight Lord, the card representing Sartorius’ evil, but in doing so, willingly loses the duel to an effect of White Knight Lord. Again in the Japanese version, following the battle, he dons his former outfit, revived as Black Thunder (Burakku Sanda-), though others continue calling him by his first nickname in the series. After his defeat in the English version he realizes that while he was in the society he defeated Alexis and vows to rescue her from the Society of Light. After Chazz realizes he was blinded by Sartorius’ powers he had no memory of the earlier parts of the duel, in fact when Chazz saw “Ojama Yellow” on Jaden’s side of the field because of the fact he couldn’t remember the time he spent in the Society of Light he thought Jaden stole his deck. Also it’s revealed that as a Slifer Red Chazz acts more like a slob because when he was still his old self he used his old black jacket to wipe up food from the cafeteria. It’s also revealed that unlike he is made to believe Chazz harbors a great deal of dislike for the color white. In episode 102, Chazz, with the assistance of the remaining Obelisk Blue students, takes on the Society of Light’s members to make amends. They successfully return most of them to their former selves, releasing Duel Academy from the Society’s grip, but before Chazz is declared champion of the Genex tournament, he is challenged by Blair Flannigan, who had come back to Duel Academy in hopes of officially entering Slifer Red. He defeats her, and is therefore allowed to return to Obelisk Blue, but ultimately finds himself back at Slifer Red because of the little respect he receives. Shortly after the beginning of the third year, Chazz, irked by the superiority and secrecy of the Gecko family, forces Adrian Gecko into a Survival Duel wherein the participants are suspended from helicopters. Although he puts all his strength into attaining victory, he is knocked off his dueling platform and into the lake with his opponent’s final strike. After Duel Academy is pulled into an alternate dimension, Chazz and the rest of the cast are left to watch the Academy while Jaden and the foreign champions go out to find medicine for Blair’s illness. When the Academy itself comes under attack from zombified students, Chazz is unable to repel them indefinitely, and becomes one of them, though he recovers after Duel Academy is returned to its proper place. When Jaden decides to go rescue Jesse Chazz, along with Bastion, Alexis, Syrus, Atticus, Jim Crocodile Cook, and Axel Brodie, willingly volunteers to join him into the other dimension. Later on, Chazz is sacrificed when Jaden duels against Brron, along with Alexis, Hassleberry, and Atticus. Chazz is later revealed to be alive, trapped in another alternate dimension by Yubel. At the beginning of the fourth season, Chazz is promoted to the Obelisk Blue dorm along with Blair and Syrus. He still has his childish crush on Alexis, as indicated by how much he wanted her as partner during the pair Duel tournament, resulting in an argument with Syrus. Because of this, he ends with no partner, making him have to sit the tournament out. Chazz also has plans to be a Pro League Duelist without the help of his brothers. Aster takes him as his student and teaches him about the stressful life of being a Pro League duelist. After Chazz gets Aster’s final Destiny Hero card stolen, he talks to Mike, who tells him to go to Duel Academy in Aster’s place. Chazz goes on to duel the Academy’s strongest student, which happens to be Jaden. During this duel, Chazz realises that learning about the cards does help with a duel and Chazz would have defeated Jaden with Chthonian Polymer if Mike didn’t intervene and tell Chazz that all he had to do was give the audience a few laughs. Aster loses his position in the Pro League and ends up dueling Chazz because of his mistakes. During their Duel, Jaden intervenes and clears things up for the guys and Aster receives the “Final D-Card”, Destiny End Dragoon. Although he summons it, Chazz summons Armed Dragon LV10. Chazz wins by using Ojama Yellow to direct attack Aster, dubbing him his “ace” and kill off the rest of his life points with Pride Shout. During Trueman’s siege, he is one of the last students to be defeated and sucked into the World of Darkness. In it, Atticus was shown the darkness within Chazz’s soul. He was dueling in the pro league, however he was driven into a situation where he was forced into cheating. Therefore, his darkness was that he wanted to win whatever it takes, the very same reason he joined the Society of Light. He is revived as Jaden defeats Nightshroud. To further elaborate, Chazz and the rest are attacked by multiple copies of Trueman who is trying to get everyone mind controlled, while Jaden is not there to stop him. Eventually, Chazz, along with Mindy, Jasmine, Alexis and Atticus were the five remaining students in Duel Academy who were not consumed by Darkness. Chazz and Atticus bought time for the other three by dueling against Trueman. Although the duel is not shown, it can be assumed that it took awhile- Alexis was cornered and defeated before he was, despite his duel starting much earlier. After his defeat, he is consumed into Darkness. Along with Syrus and Alexis, Fujiwara initially has difficulty trying to get him to reveal the darkness in his heart. However, after placing him in illusions of failing in his career as a pro, having to quit, and then losing to a gang of Rare Hunters (apparently going under the same name as the gang in the original Yu-Gi-Oh! series) in an ante-duel. Each of the duels were nearly identical, with the last turn always being a choice between using the Spell Card “Reload” and summoning Ojama Yellow in defense position, before he lost. Eventually he cannot take it anymore, and his soul is consumed by a black wave of darkness. This illustrates Chazz’s fears of not living up to the expectations of his family as well as others, as that is the theme of his darkness illusion. Chazz Princeton’s decks vary greatly throughout the Seasons of the Yu-Gi-Oh! GX anime. His ever-changing deck is a parallel to his ever-changing philosophy on dueling and his place in the world.